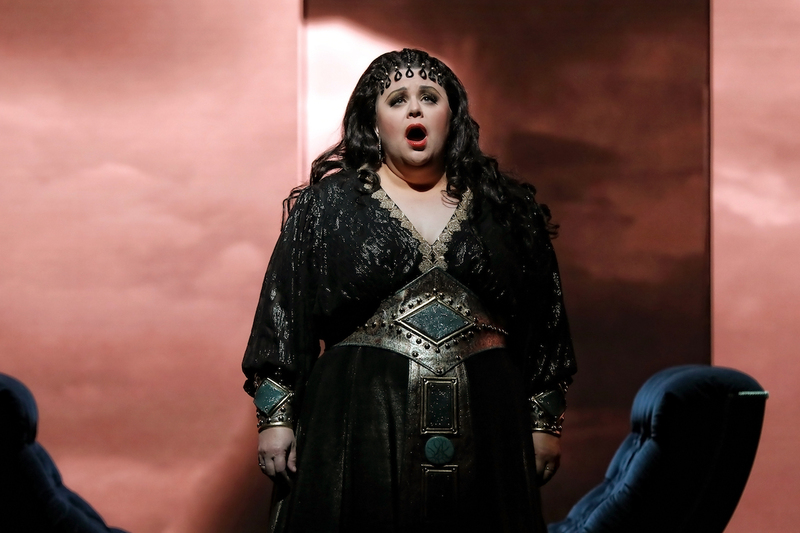 Opera Australia takes a huge risk bringing 19th century opera into the 21st century with its extraordinary 2018 interpretation of Verdi’s doomed love triangle, Aida. 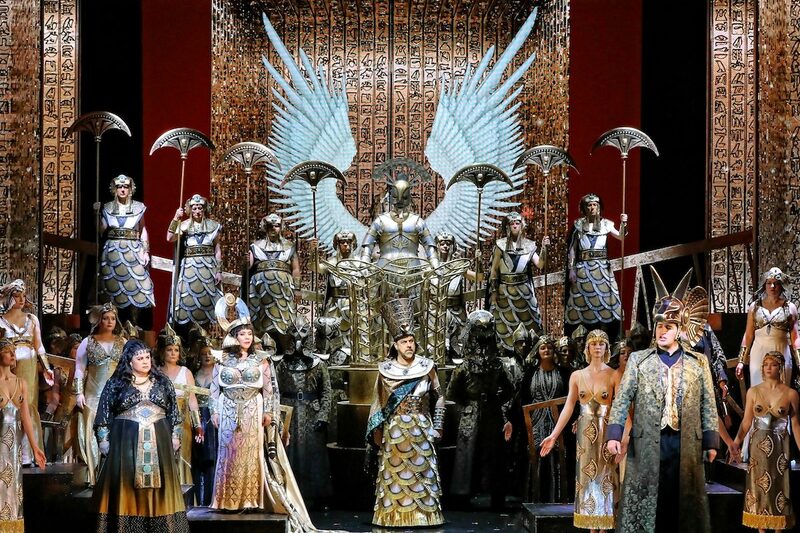 As a refresher, simply put, the enduring tale of a doomed love triangle of Ethiopian slave Aida, Egyptian princess Amneris, and Egypt’s hero Radamès originated from a French libretto that Verdi had translated into Italian and composed the score for. So, with these international beginnings in mind, it comes as no great surprise when the troupe of extraordinary carbon-copy, Egyptian-wigged dancer–warriors lead the cast in a beautifully choreographed haka, at Opera Australia’s opening night of Aida in the Joan Sutherland Theatre at Sydney Opera House. In a risky marriage of 19th century opera and 21st century technology, under the auspices of OA’s Lyndon Terracini, set designer Giò Forma has created an extraordinary backdrop of revolving, sliding and rotating seven-metre-high LED screens that depict everything from the bloody shades of war-torn Ethiopia, writhing cobras and Egyptian warriors to the goddess Isis and a dominating black panther. 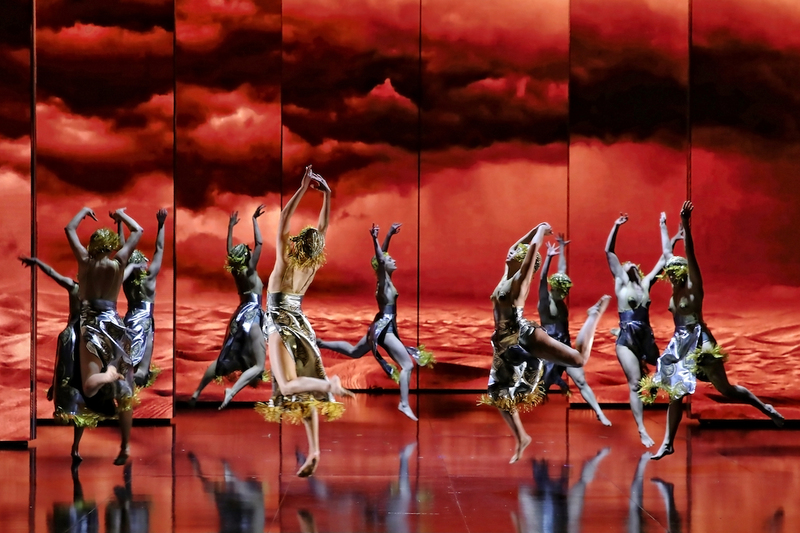 Prior to opening night, Terracini told the SMH that “No other opera company in the world – no other theatre company in the world – is using technology to this extent.” Director–choreographer Davide Livermore, who brought the vision to life to make this digital production soar, is quick to admit that all the tech wizardry would mean nothing without the narrative. Along with the talents of costume designer Gianluca Falaschi’s meticulous wardrobe – from the decadent, sequined apparel of princess Amneris, the stunning dresses of the cast and the waif–warrior dresses (that give the illusion of bare breasts), to the costume of the king (Jud Arthur) and the masks and armour of the Egyptian guards – the entire production comes together into a seamless, sumptuous experience that captivates the audience, making the three-hour performance flash by. Amber Wagner portrays Ethiopian slave–princess Aida’s emotional conflict with so much believability, and an evocative voice that has the audience unknowingly shaking their heads as they’re swept up in the experience. On opening night, you could have heard a pin drop while soprano Wagner performed ‘O Patria Mia’, which was followed by an almost audible collective sigh when she finished before the audience burst into extended, rapturous applause. 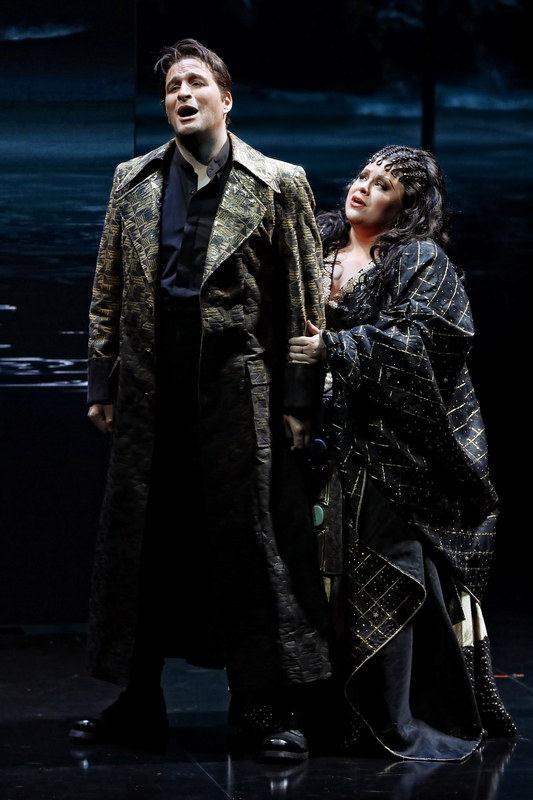 Tenor Riccardo Massi (Radamès) strides into the role with consummate ease, moving from would-be hero, to national treasure and heartbroken lover with grace and feeling. 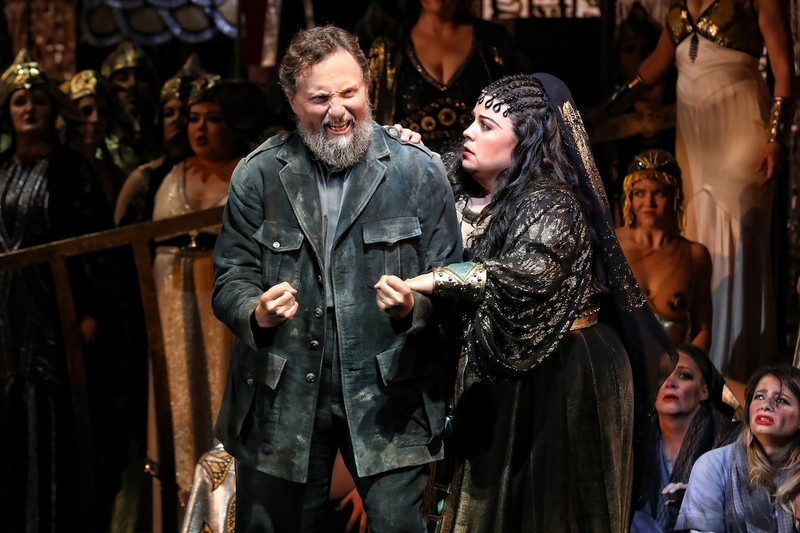 The trio’s voices work beautifully together and are supported by Warwick Fyfe’s Amonasro, who is received like a much-loved returned son by the Sydney audience, while Roberto Scandiuzzi’s bass tones beautifully encapsulate the gravitas of high priest Ramfis. The voices of the supporting leads and a stellar chorus combine as a solid foundation for the main cast, and occasionally rumble almost subliminally from backstage to allow the story to unfold while the audience remains focused on the lovers. All of this is driven by the engaging energy and exceptional talent of 31-year-old conductor Andrea Battistoni leading the exemplary Opera Australia Orchestra. So did OA pull off this 21st century feat? The extended applause throughout the performance, the cries of ‘bravo’ and ‘brava’ and the standing ovation leaves no doubt. 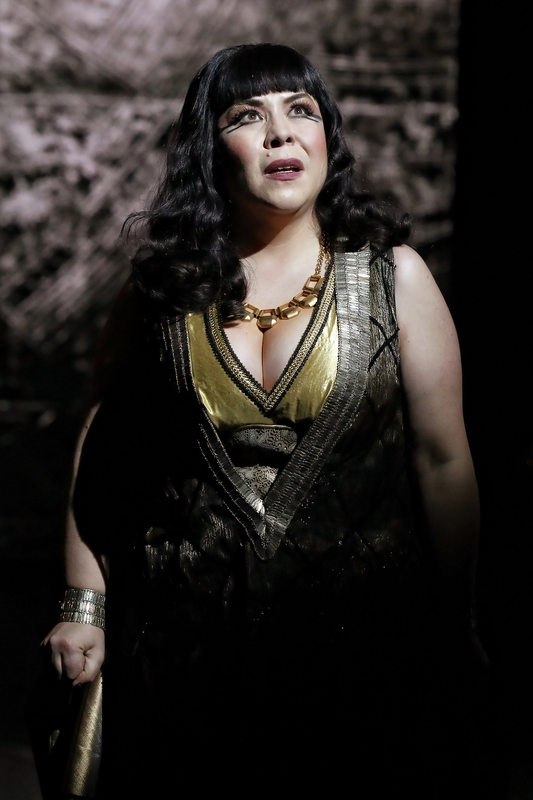 Opera Australia’s 2018 production of Aida is at the Sydney Opera House until 31 August with an alternating cast including Natalie Aroyan (Aida), Clémentine Margaine and Milijana Nikolic (Amneris), Yonghoon Lee and Diego Torre (Radamès), and Michael Honeyman (Amonasro).